Although pediatric cancer is rare, it’s the leading cause of disease-related death among children who survive past infancy (in the Western world). Around 1 in 500 children will be diagnosed with cancer by age 15. Like most rare diseases, childhood cancer is difficult to study because so few patients are available. Even for the most common types — leukemia, brain/CNS tumors, and lymphomas — only a few hundred cases have been sequenced over the past decade. But we’re making progress. Two consortium-led studies published last month in the journal Nature offer the most comprehensive surveys to-date of pediatric cancer genomes. The mutation rates in pediatric tumors ranged from 0.02 mutations per megabase in hepatoblastoma to 0.49 in Burkitt’s lymphoma. Yet overall the mutation rate in pediatric tumors was 14 times lower than that of adult tumors profiled by TCGA. Mutation rate was also correlated with the patient’s age, which is a trend we’ve seen before. Consistent with previous studies, the authors found pathogenic germline variants in 7.6% of their pediatric cases. Most of these were in DNA repair genes, i.e. mismatch repair (MSH2, MSH6, PMS2) or double-stranded break repair (TP53, BRCA2, CHEK2). Predisposition was most common in adrenocortical carcinomas (50%) and hypodiploid B-ALL (28%), followed by high-grade gliomas, medulloblastomas, and retinoblastomas (15-25%). Using the Mutation Significance In Cancer package, the authors identified 77% significantly mutated genes (SMGs). About half of all cases harbored at least one mutation in an SMG, and the frequencies of SMG mutations suggested that they were early, driver events in tumorigenesis. Most SMGs also showed mutual exclusivity with one another across cancer types — meaning that a tumor with a mutation in gene A almost never had a mutation in gene B — suggesting that a single mutation event is often enough to drive childhood cancer. TP53 was the most commonly altered gene, which is unsurprising. Interestingly, the most commonly mutated set of genes were those involved in epigenetic modification (25% of tumors) followed by transcriptional regulators and MAP kinase-associated genes (12-15%). The authors identified 453 potentially druggable events (PDEs) in 59 genes, 3% of which were germline variants. Most commonly, PDEs were detected in Burkitt’s lymphomas (the highest mutated) and pilocytic astrocytomas. After adjusting for relative incidence, 52% of pediatric tumors had a potential druggable event. This supports the idea that genomic profiling should be a routine part of pediatric cancer care. Study 2, led by researchers in the U.S., analyzed the genomes and transcriptomes of 1,699 pediatric leukemias and solid tumors representing six histotypes. All tumor samples were obtained at initial diagnosis via the Children’s Oncology Group (COG) trials. This is a landmark study not only due to the size, but the systematic characterization of each case using whole-genome sequencing (WGS), exome sequencing (WES), and transcriptome sequencing (RNA-seq). A key advantage of whole-genome sequencing in cancer is that it captures the full scope of somatic alterations (from SNVs to large structural variants) throughout the genome. The authors assigned somatic mutations to 96 different bins (based on the substitution and sequence context) to assess the “mutational signature” of each tumor. There were 11 distinct mutational signatures, henceforth referred to as T-1 through T-11. Endogenous mutational process signatures (T1 and T4) were present in all tumors and accounted for a large proportion of the burden in T-ALL (97%), AML (63%), B-ALL (36%), and Wilms tumor (28%). APOBEC family mRNA editing signatures (T2 and T7) were highly enriched in B-ALLs that had ETV6-RUNX1 fusions. Homologous recombination deficiency (T-3) was evident in many tumors, especially osteosarcomas and NBLs. Oxidating DNA damage (T-8) was present in 36% of neuroblastoma signatures, and associated with age at diagnosis. The UV-light exposure signature (T-5) was present in all eight B-ALL samples. This last one was surprising, since we think of ultraviolet exposure as contributing to melanoma idults, but not B-ALL (a leukemia of B-cells) in children. But the signature was 110-fold enriched in B-ALL tumors compared to other types in this study, and other observations, such as transcriptional strand bias, suggest it’s not an artifact. The authors identified 142 “driver genes” that were significantly mutated within a histotype or across the cohort. More than half of these were specific to a single histotype, and 83% of driver genes were not shared between liquid and solid tumors. In other words, different pediatric tumor types seem to arise from different mutated genes and pathways. Childhood cancer genes also differed from adult cancer genes: of 142 significant genes in this study, 78 (55%) were not found in adult pan-cancer studies and 43 (30%) were not in the Cancer Gene Consensus. 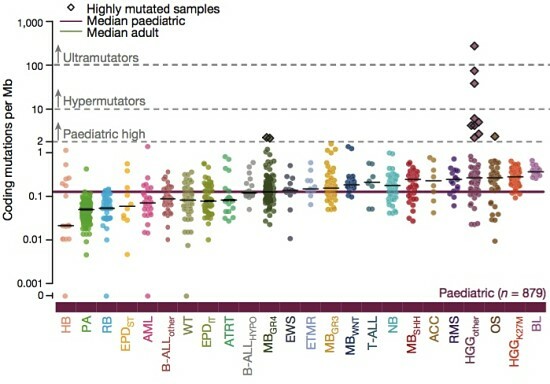 Some of the earliest studies of cancer genomes in AML noted that, within a single patient, there were subsets of mutations present at lower allele frequencies, suggesting that they’re not present in all cells. These “tumor subclones” are often very relevant as the tumor evolves (especially during treatment). In this study, the authors noted that 40-50% of somatic point mutations in leukemias showed lower allele frequencies, suggesting that subclonality is also an important feature of childhood leukemia. I’ve always been a proponent of WGS but it seems especially warranted in genomic studies of childhood cancers. Transcriptome sequencing is incredibly valuable for cancer genomics, because it offers insights into the immediate molecular effects of somatic mutations. In this study the authors analyzed 6,959 coding mutations that had genome and transcriptome sequencing coverage. The mutant allele was expressed (detected in the RNA) in 34%. Detection correlated with both the relative expression level of the gene and the allele frequency of the mutation in the genome. 76% of truncating (loss-of-function) mutations showed suppression of the mutated allele, likely via nonsense-mediated decay. 87% of hotspot (gain-of-function) mutations showed elevation of the mutated allele, likely because they conferred an advantage to the tumor. In other words, the expression of a somatic mutation generally reflects its purpose for the tumor: loss-of-function mutations are suppressed, but activating hotspot mutations are over-expressed. What a great story. These two studies represent landmark achievements for the field of childhood cancer genomics. They also demonstrate that pediatric cancers are unique from one another and from adult cancers. In short, genomic analysis (and especially whole-genome sequencing) is deeply informative for childhood cancers, and we should do a lot more of it.